1. In the upper-right corner of your OWA page click Options, See All Options… . 2. 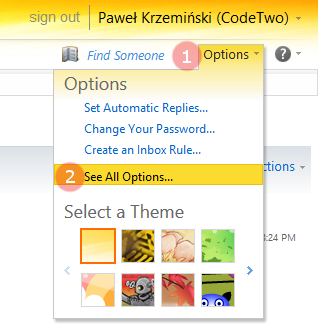 On the Options page, click Settings, make sure the Mail tab is selected. Now you can start composing your own signature. This entry was posted in Microsoft Exchange Server 2010, OWA 2010 and tagged client based email signature, exchange 2010, owa 2010 on May 5, 2015 by Adam the 32-bit Aardvark.